Which politician took the most grief from Jay Leno? (CNN) - As "The Tonight Show" host Jay Leno prepares for his final show Thursday, a study of the comedian's jokes show former President Bill Clinton was his top political target during his tenure. The Center for Media and Public Affairs at George Mason University analyzed 43,892 jokes about public figures and public affairs over the past two decades. 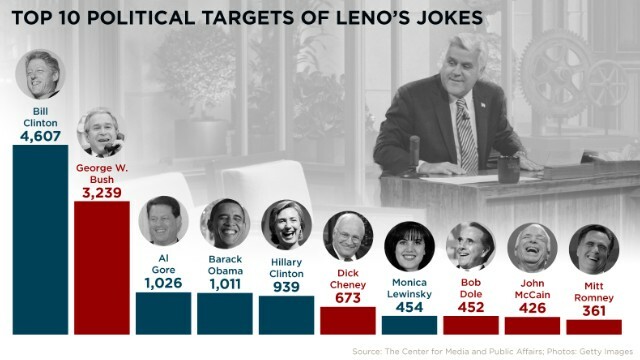 The study lists the top 20 politicos who took heat from Leno. “This should be vetoed. It is an atrocity. 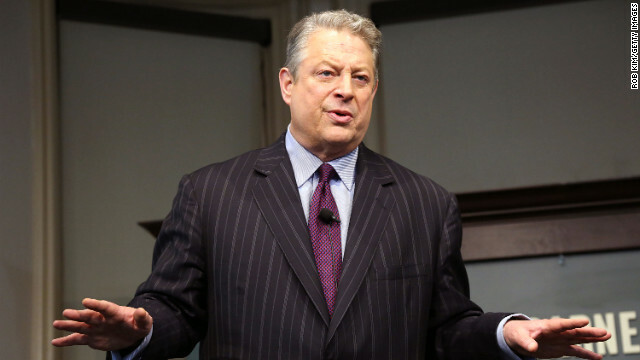 It is a threat to our future,” Gore said during a speech at a policy forum held by the left-leaning Center for American Progress. Washington (CNN) - Former Vice President Al Gore unleashed some biting words Friday on the Republican-led strategy to defund Obamacare or risk a government shutdown. "The only phrase that describes it is political terrorism," he said at the Brookings Institution in Washington. (CNN) – Former Vice President Al Gore said he's optimistic about the future of the climate change debate, arguing Republicans are growing weary of global warning deniers. In an interview with The Washington Post, Gore said climate change activists are in the process of "winning the conversation," just like activists won the civil rights movement. (CNN) - Al Gore, environmental activist and former vice president, said he was "very pleased" to hear President Barack Obama pledge to combat climate change in his inauguration speech. He urged the president to "follow through" on his commitment. "There are some actions he can take that do not require congressional approval," Gore said in an interview that aired Sunday on CNN's "Fareed Zakaria GPS." 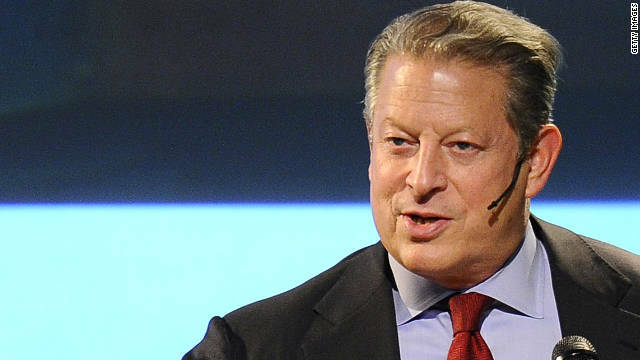 Washington (CNN) – If your name is Al Gore, your luck in electoral politics may be in question. 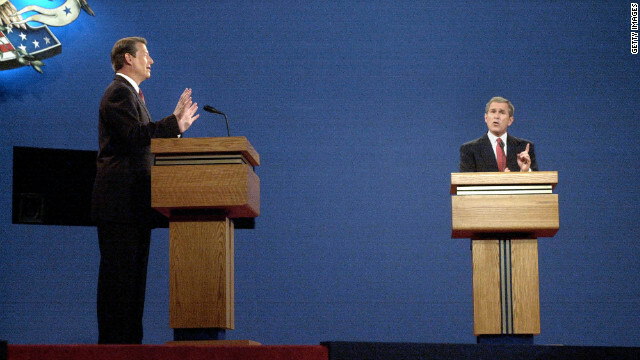 In the race for Mississippi's Senate seat, CNN projects that Republican incumbent Sen. Roger Wicker has defeated Democratic challenger Albert N. Gore Jr.
Former Vice President Al Gore on a high-stakes debate stage himself in 2000, debating then-Gov. George Bush at the University of Massachusetts in Boston. (CNN) - Former Vice President Al Gore's analysis of President Barack Obama's debate performance Wednesday: the Mile High City may be to blame. Pundits and a CNN poll of those who watched the debate both found GOP presidential nominee Mitt Romney's showing to be stronger than Obama's, who some described as appearing tired and long-winded. (CNN) – Al Gore said the country's environmental policy would be compromised if presumptive GOP nominee Mitt Romney were to become president in January. 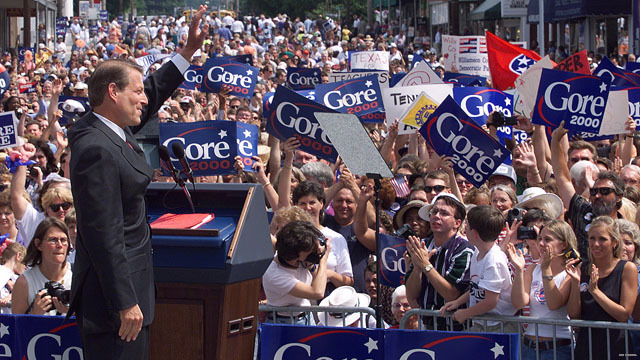 "I would fear for the future of our environmental policy," said Gore of a Romney/Ryan White House in an interview with TakePart, the publishing arm of the company that produced "An Inconvenient Truth," Gore's 2006 documentary about climate change. (CNN) – It's amazed me over the years how a few words spoken by a presidential candidate potentially can have an enormous impact. I've been thinking a lot about that while covering the Republican race for the White House in recent months. The candidates are under enormous scrutiny – as they should be. They understandably have to be very precise. I've been especially sensitive to the words uttered by candidates since my interview with then-Vice President Al Gore in March 1999. 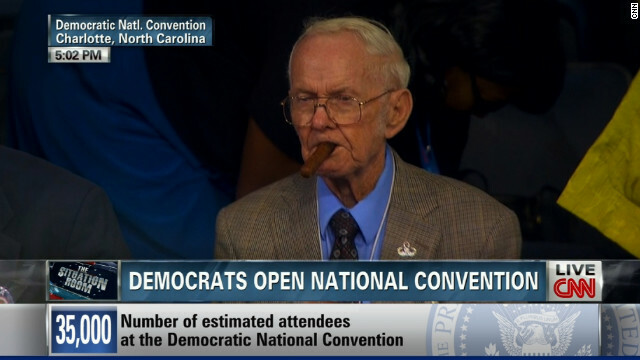 He was already running for the Democratic presidential nomination. Here's the exchange that caused an uproar and certainly had an impact on his eventual general election race against then-Texas Governor George W. Bush.